Based on the long running newspaper comic strip of the same name "Marmaduke" came to the big screen as a live action/computer animated film in the summer of 2010. Surrounding the story of a Great Dane named Marmaduke and the antics of dealing with his size and less than average intelligence, the one panel strip has been running since the 1950's. Those unfamiliar with the concept of "Marmaduke" (especially small children) may find some charms with the action and juvenile comedy while those "fans" of the strip may be left wondering what, exactly, one has to do with the other. The basic plot of the film version of "Marmaduke" surrounds the family that takes care of Marmaduke (voiced by Owen Wilson) moving from Kansas to California. There he meets a female dog named Mazie who develops a crush on Marmaduke. Meanwhile Marmadukes owner, Phil (Lee Pace) is tasked with creating an new ad campaign for his boss (William H. Macy) to get their line of Organic dog food into pet stores. The antagonist of the film is the alpha dog "Bosco" (voiced by Keifer Sutherland) and his two minions dogs Thunder and Lightning. Bosco and Marmaduke do not get along especially since Marmaduke develops a crush on Boscos girlfriend Jezebel (a well groomed border collie). Bosco is an established "surf dog champion" who after being beaten by Marmaduke at surfing becomes enraged. The competition was put on by Phil to sway the pet store executives to buy the organic dog food. After seeing the two dogs fight, the pet storeowners balk and Phil gets fired. Only after a life saving rescue of Marmaduke by Phil (which gets posted to YouTube with hundreds of thousands of hits) do the executives come around and Phil wins the account. In the end, Marmaduke and Mazie are dating, Marmaduke and Jezebel are friends, and all is well. The CGI effects to animate the speaking dogs is nothing new and the " dog surfing" scenes with extensive use of computer imagery are cartoonish. Not that any part of them are supposed to be realistic (this is a after all a movie geared towards children) but the high definition picture of the Blu-ray disc shows these flaws clearly. Despite being geared towards children, much of the "humor" is geared towards the parents. This is a typical trend in Hollywood with these types of family films, but most of the jokes fall flat and don't mesh well with the cartoony unrealistic action going on onscreen. Appropriate perhaps for younger audiences, (ages 3-5) Marmaduke fails more than it succeeds and goes on a bit too long for its own good. Download Marmaduke from the iTunes Store in Digial HD. 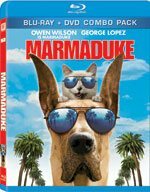 For more information about Marmaduke visit the FlickDirect Movie Database.